It has been said quite aptly and theologically correctly that God may save us unilaterally, but he chooses to respect our decision to want to cooperate and accept this great un-deserved offer of salvation with our free will. All attempts at explaining why there is evil in the world despite there being a God who loves and wants to save ultimately comes back to this principle. Christmas is a lavish display of how small God is willing to be and the extent he goes to show his love for us. He diminishes himself in order for us to be engulfed and enveloped by his mercy and love, the effects of which are not unlike how an earthquake caused by the slight shifting of the earth’s tectonic plates miles below the surface of the ocean may result in the tremendous force of a tsunami later on. The only difference is that unlike a tsunami which causes untold amounts of chaos and destruction, this tsunami of God’s love that began as a tiny spark in the womb of Mary, is set to become the tidal wave of love that wants to wash over and envelope the entire human race in order for it to truly live, grow and flourish. Tsunamis don’t give you a choice. Tsunamis do not respect anything. Everything it is path is obliterated and subject to its tremendous force. This is where the syllogism ends. God’s love, incarnate in Jesus Christ at Christmas, gives us a lot of room for choice and is utterly respectful of human freedom. The only thin God’s love is interested in obliterating and rendering powerless are the effects of evil and sin. Looking that the infant Jesus at Christmas, it hardly invites us to consider this aspect of Christianity’s awesome reality. We are too easily distracted by the bucolic sentiments that surround the Christmas crib or Nativity scene. This is the wonder of Christmas, which seems to be easily missed by the millions throughout the world who observe Christmas with nostalgia or a “happy holiday” event. I’ve written reflections in the past on my sentiments about celebrating Christmas merely on a superficial level with it being a mere holiday event, or wishing each other the non-descript greeting of “compliments of the season”. It could be because I’m getting on in years, or it could be that I am beginning to truly believe that God does write straight with crooked lines that I am not so uptight about these things as I was in my more earnest and younger days as a priest of God. As longa s one isn’t a naysayer, or an outright atheist who angrily dismisses the existence of a loving God, but if one allows goodness to thrive and promotes this in and through one’s being, I am convinced that there is really no saying how much God can do to enlarge one’s heart from a spark of goodness within. This was something that dawned upon me recently when I was visiting the Notre Dame Cathedral in the city of Paris, France. I was blessed to be able to vacation in the city, and went into the church one day for my evening prayer, also known as Vespers, the official prayer of the Church. This Cathedral is probably on every visitor’s must-see list, and that evening, Notre Dame was really ‘packing them in’. I joined in this long queue in the cold winter night air that made its way past security to enter the nave. The Catholic Priest in me made an immediate beeline to the Blessed Sacrament chapel, which was not really easy to locate. I had to encircle the nave twice before I realized that I had passed it on my initial attempt. When I had completed praying Vespers, still seated in my pew, I realized that all the while that I was praying there, I was the only one in that small chapel. Meanwhile, hundreds, if not thousands of tourists were walking around with mouths agape, some craning their necks to take in the awe-inspiring interior of this behemoth of a church. Others had their noses buried in their guidebooks, taking selfies, chatting with one another, and some had their earphones in their ears that provided a guided commentary explaining the features and significance of what they were seeing. But for the most part, they simply filed past the Blessed Sacrament, oblivious to the fact that the true awesomeness of the Cathedral lay not so much in the physical structure of the building, but that the Lord himself is truly present there in the Tabernacle of that Chapel. “Was God offended with what was happening?” I asked myself quietly. Probably not. He took a great chance at Christmas to come to us in such a hidden and under-appreciated form – a tiny infant that was so dependent on human care. This was something so easily bypassed by anyone walking by that manger in Bethlehem 2000 years ago. It shouldn’t surprise anyone then if people are strolling by a Blessed Sacrament chapel in something as majestic as the Notre Dame Cathedral in Paris if they too pass him by once again. It’s probably a macrocosm of what has been happening all over the world, what with Christmas being celebrated as a holiday more than as a holy day. 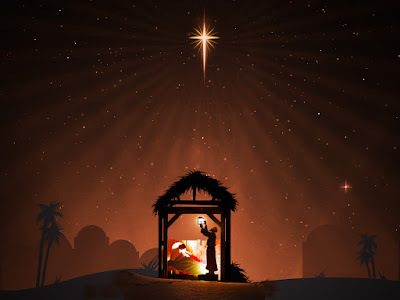 The first persons to hear the message of the truth of the Bethlehem baby were shepherds. As a priest of God, I too, am a shepherd, and I see with a renewed vision my task to bring God’s love in a new and real way to those who in life are like those thousands of tourists in the Notre Dame – looking but not really seeing, and living lives oblivious to the fact that God is indeed in the world and among them. As you read this, dear reader, I wish you a most blessed Christmas, and may real Christmas joy be in your heart.